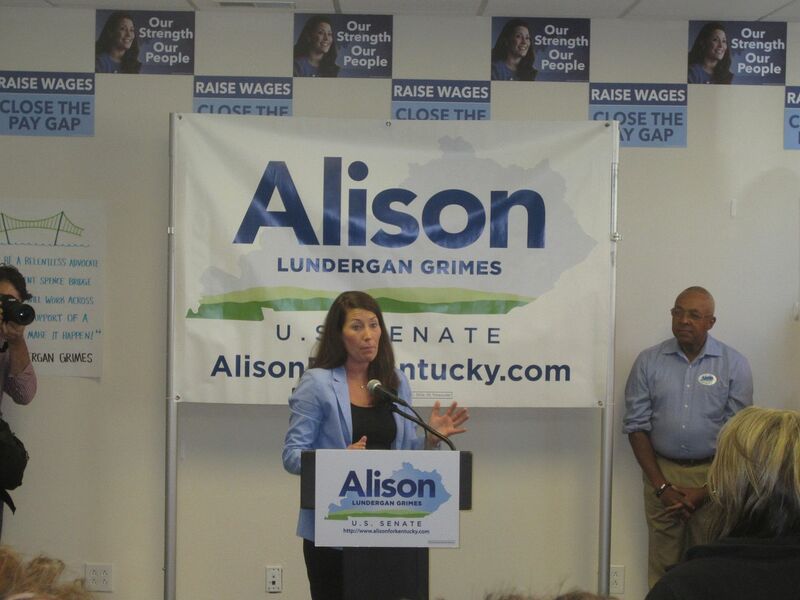 Senator Mitch McConnell returned to Northern Kentucky on Tuesday, hours before his opponent, Democratic Secretary of State Alison Grimes, released an internal poll showing the senate minority leader trailing by two points. The Mellman Group, which conducted the poll for Grimes, said that its poll has the lowest margin of error of any poll released so far because it uses the largest sample size. According to the poll, Grimes has 42% to McConnell's 40%, while Libertarian David Patterson scores 3%. 16% are undecided. 38% of independents are supporting Grimes, the poll said, while McConnell enjoys 29% support from them. McConnell told The River City News on Tuesday that this race is not necessarily the toughest he's been in, but it is among the more unusual. He said that the national and international attention this race is getting, since he is the leader of the Republicans in the Senate, is different. The Commonwealth's senior senator, first elected in 1984, appeared at Oriental Wok in Ft. Mitchell for a happy hour with the Northern Kentucky Young Republicans. He offered brief and familiar remarks and then spoke with reporters after. He applauded the work of Republicans in Northern Kentucky who have made election seasons increasingly difficult, if not impossible, for local Democrats. "The transformation here over the course of my career has been truly amazing," McConnell told the crowd of supporters and local elected officials. "You've almost wiped the other side out completely. Now you can't find a Democrat up here with a searchlight." Meanwhile, Grimes continues her effort to score points in Northern Kentucky based on the Brent Spence Bridge, and the $2.6 billion project related to it that has not yet been funded. “Rebuilding the Brent Spence Bridge is critical to Northern Kentucky, the Commonwealth and the American economy. I’m under no illusions about how the functionality of the bridge impacts downstream economies, not just in Kentucky but in many other states as well," Grimes said in a statement to The River City News. " Municipal and state governments cannot be left to take on these projects themselves – the federal government must step up too. I understand, however, that the federal government needs to tighten its belt and reduce deficit spending, and thus my plan for rebuilding the Brent Spence Bridge asks millionaires, billionaires and corporations that ship jobs overseas to pay their fair share by closing tax loopholes they exploit." "My position on the bridge has been clear and unwavering, and my opponent’s has been all over-the-map for the past 30 years." Grimes said McConnell has been at the center of Washington's current gridlock. McConnell said that while Grimes is a new face, a new face does not always mean change. "She's a new face for the status quo," said McConnell, whose campaign has labeled Grimes, "(President Barack) Obama's Kentucky candidate" in an attempt to play on the President's unpopularity here. "Change is not how new you are. It's about where you want to go and I want to take American in a different direction." "You can almost hear the American people saying they want to go in a different direction." McConnell and Grimes will debate each other on KET on Monday, October 13. Patterson, the Libertarian, is suing KET for not including him in the debate. "I firmly believe that there is something wrong here," Patterson said in a statement. "An Open Records Request showed that KET modified the criteria multiple times during the campaign season. The suspicious timing and ever-increasing thresholds seem to be created to ensure I didn't get to participate. They knew what the ramifications of those changes would be, and chose to act anyway."